Stephanie Izard is a my culinary hero! First, and only, female to win Top Chef with one of the best restaurants (in my humble opinion) in Chicago. So, I have been anxiously awaiting the opening of her new venture, Little Goat Diner. Saturday night after several a few drinks at a friend’s going-away party Charlie and I made our way to West Randolph Street to check out Little Goat Diner. 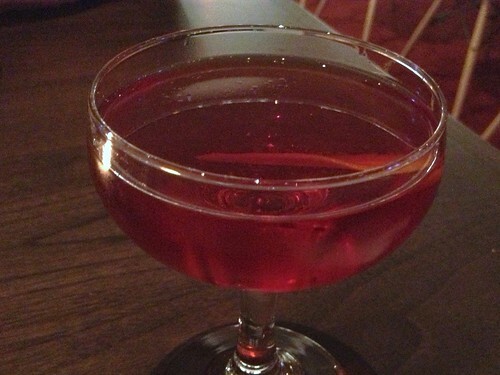 Needing Wanting another libation, I ordered a deliciously boozy cocktail. 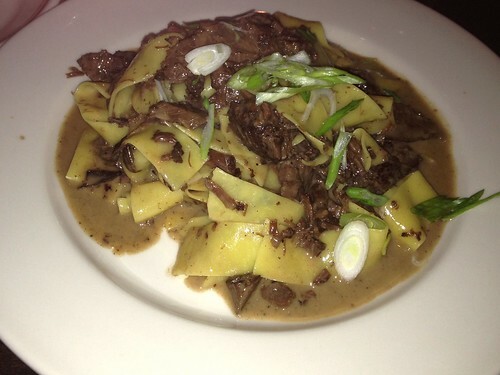 For my meal I could not resist the daily Blue Plate special: Beef cheek stroganoff. It was very very very delicious. The noodles were fresh and cooked perfectly al dente. The gravy was rich and full of flavor. But the true gem of the dish was the beef cheeks. Cooked tender with just a bit of chewiness and loads of flavor. 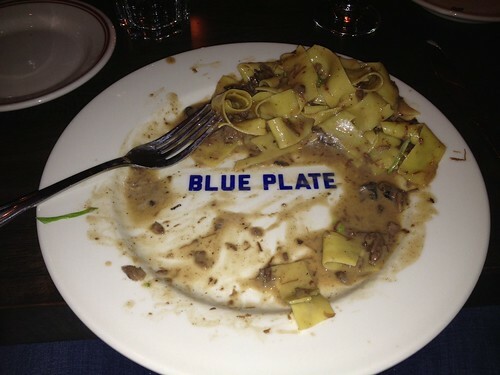 I wanted to licked the plate clean. This was the perfect dish to order at 1 AM on a on cold night. Charlie went the breakfast route with waffles. 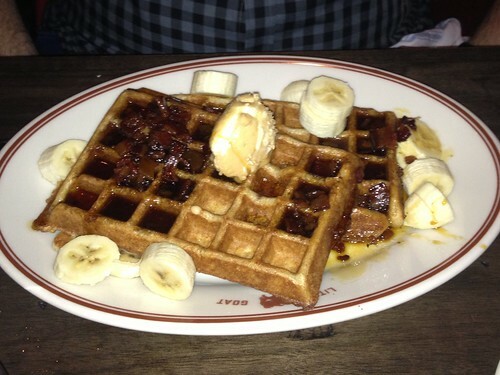 The FAT Elvis waffles were perfectly cooked waffles topped with bananas, peanut butter, butter and bacon maple syrup…OH MY. They were good. 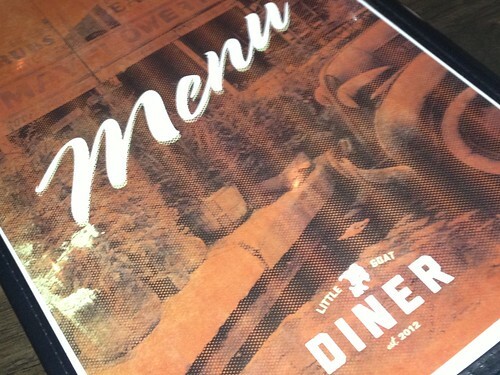 As I expected everything about Little Goat Diner met my expectations, and then some. The ambiance is wonderfully casual. The service is friendly and fast. But most importantly the food is spot on WONDERFUL. Bravo Stephanie Izard, I cannot wait to go back. 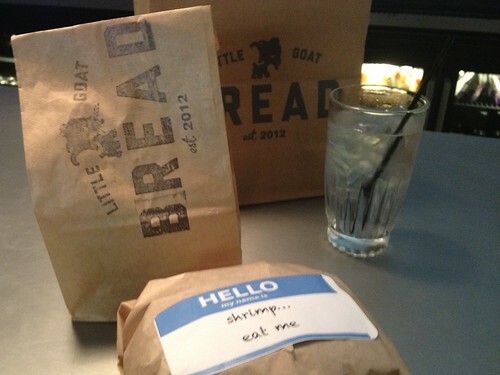 If you don’t have time for a full sit down meal I also highly recommend Little Goat Bread. Over my holiday vacation Charlie and I stopped in for a quick sandwich one afternoon. Like everything else Ms. Izard cooks up, it was FANTABULOUS. 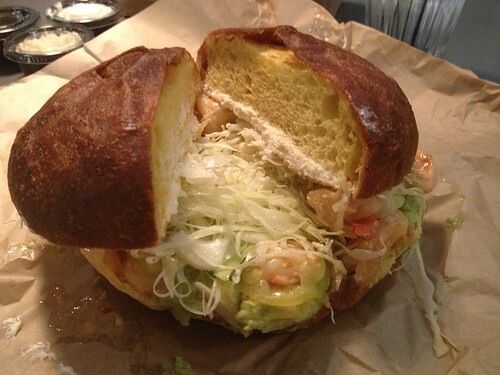 I had the shrimp salad sandwich: shrimp with spicy mayo, avocado, onion cream cheese, masa chips on a potato bun. First off, the sandwiches are HUGE. The potato bread was amazingly fresh and tasted like POTATO (not flour which is what you get in many other places). The shrimp were sweet and perfectly cooked. The avocado added richness. The cream cheese balanced the spicy mayo. But the masa chips, they were the perfect CRUNCH that added texture to the sandwich. Not pictured was Charlie’s egg salad sandwich which was equally tasty. We also shared a small goat chili. It is more of a Greek style chili and came with several chili accoutrements (sour cream, cheddar and pizza poofs). If your not into cinnamon then the chili will not be your thing. I thought it was rich and flavorful but I will be honest, the sandwiches are so HUGE and flavorful that there is no need for a side dish to walk away feeling completely satisfied. Thank you Stephanie Izard for bringing more of your great food to Chicago!